The Answer to your Promotional Puzzle! New to the Fun Pens category: the Puzzle Pen! 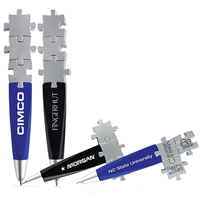 Any promotional item that involves some kind of puzzle is metaphoric to business solutions, connections, networks, achievement, merger or affiliation. Social interactions like these are imperative to all businesses to achieve success and promotion. A different message can be printed on each piece. Use slogans such as “Solving life’s puzzles”, “Making connections”, “Bringing the pieces together”, or “No problem left unsolved”. Each part interlocks creating several different formations. Intriguing for hours, it’s hard to put the puzzle pen down. It’s a great trade show item or fun brainteaser giveaway. Rudee December 17, 2008 Comments Off on The Answer to your Promotional Puzzle!